South African lock Franco van der Merwe is hoping Saturday won’t be his last meaningful game in an Ulster shirt. The Irish Province travel to Swansea and a bonus point win for the Ospreys coupled with the Scarlets getting two match points at Connacht would end Ulster’s season with a game to spare. Van der Merwe leaves Belfast at the end of the season for Cardiff and he wants knockout rugby. “It will be special being involved with Ulster and going to the playoffs but it is just not about me it is about the team and the organisation,” he said. “If the team and organisation is doing well I’ll be pretty happy if I’m involved it will be brilliant and if I’m not I’ll still celebrate, I hope we can end on a high. Ulster have only lost one of their last seven games against the Ospreys and went to the Liberty Stadium on the final day last season and produced a 46-26 win to qualify for the semi finals but this time Steve Tandy’s side are also challenging for a top four spot. “Last year we had a decent run over there, we’ve had a good run in up until slipping against Munster. “We have had seven on the trot where they have had a couple of games that didn’t go their way and one or two of those have been really tight. 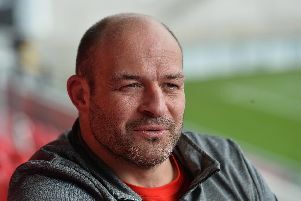 The former Springbok is hoping Ulster’s previous experience of going to the wire in terms of qualifying for the top four will help this time around. “We have learned from those and we want to go one better this time around,” added the South African.